This past Sunday marked the beginning of a weekly Farmers Market in College Park. 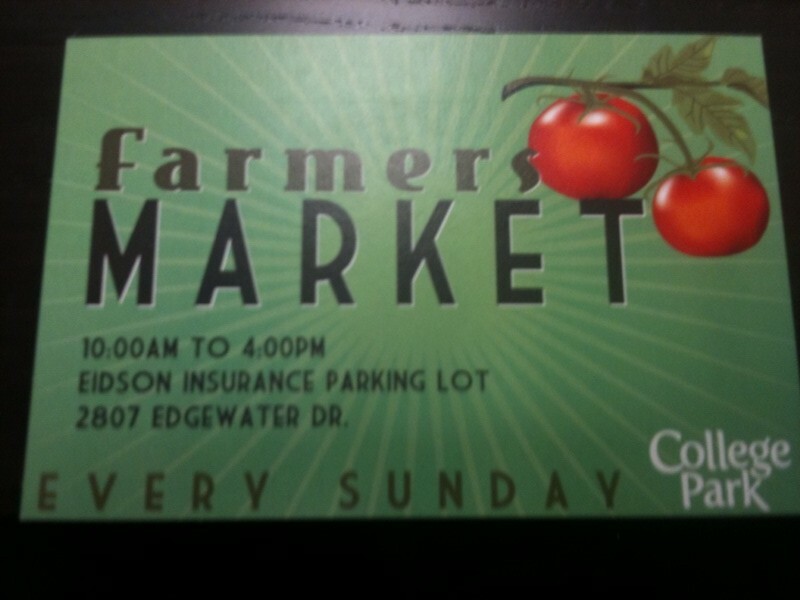 Every Sunday from 10 am to 4 pm there will be a Farmers Market in the parking lot of Eidson Insurance at 2807 Edgewater Drive. We hear the first market had a great turnout, but would love to hear more from you. Have you been? Do you think Orlando needs another Farmers Market (they seem to be popping up everywhere!)? For vendor information, contact Omar Caiola, or Friend the Farmers Market on Facebook here. College Park residents have been waiting for this Farmers Market for a long time and are thrilled. I think people prefer farmers market type shopping, but it has to be convenient. The time is great too. 10 -4 on a Sunday allows you to shop for the week. So many people I saw this week stopped in on their way home from church as well. I have never been to the Winter Park market because Saturday is my only day to sleep in and it’s so early. This is perfect for me and will attract others who feel the same way. You should see the bustle in College Pk now on a Sunday. We haven’t seen that in awhile. Will be good for our local economy too! @Debbie, I totally agree. I’ve been living in the wonderful College Park neighborhood for a couple years now. It’s great to have access to this sort of stuff within walking distance. It’ll be a good thing for local businesses! Love that there is a new Farmers Market. Problem is they are all over on the east side of Orlando. I have MAJOR trouble finding one that stays, in south Orlando. If anybody knows of existing ones out by SeaWorld and Disney, would love to hear about it. Not sure if this is good or bad – they are discontinuing this market time, day and location and moving the College Park Market from Sundays to Thursday nites from 5-9pm and relocating it to Infusion Tea further up Edgewater. The last Sunday Market will be on June 6 — then on Thurs the 10th the market will be at the new location. @Martin, Thanks for the update!